But I do love to freshen up my house and wardrobe with a few key (trendy) pieces every once in awhile. Last week, HomeGoods invited me to New York with about 20 other bloggers so we could talk about blogging and social media and style and basically just have a fun and informative day (oh, there was wine too). One of the speakers was from The Doneger Group – a firm that specializes in forecasting trends and knowing what consumers want. I thought it would be fun to share and I’m sure you probably already have some of these in your home that you have loved for awhile! It’s all about paper and real books. Bookshelves in the kitchen, cozy English Chesterfield sofas and anything that creates the look and feel of an old school library. 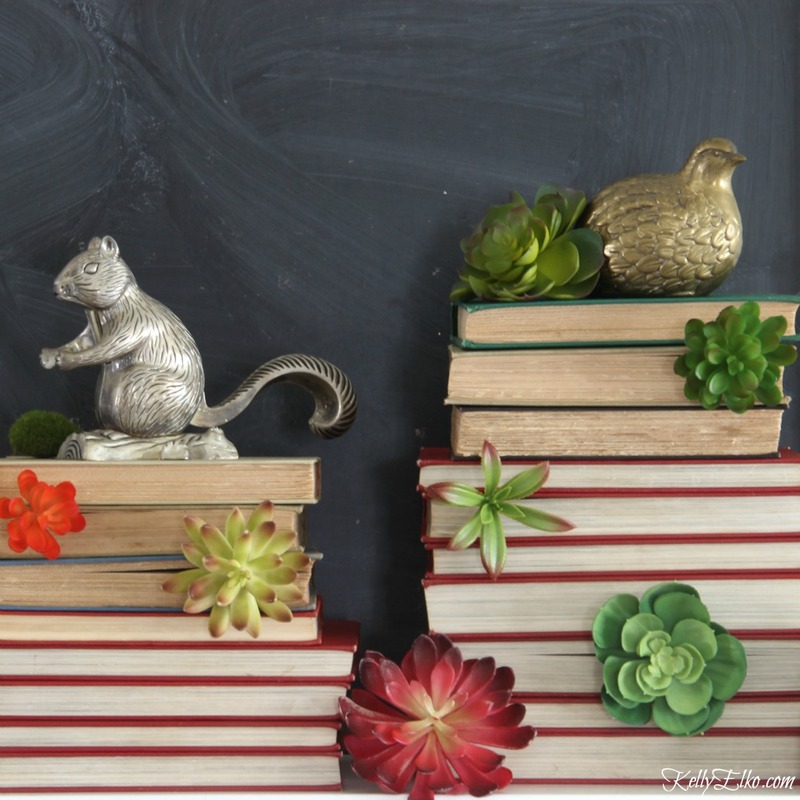 Upcycling old books and magazines into folded works of art, walls of books, book headboards – I used stacks of old books as a vertical planter on my winter mantel. Letters including typewriter letters and messages on glass and china. 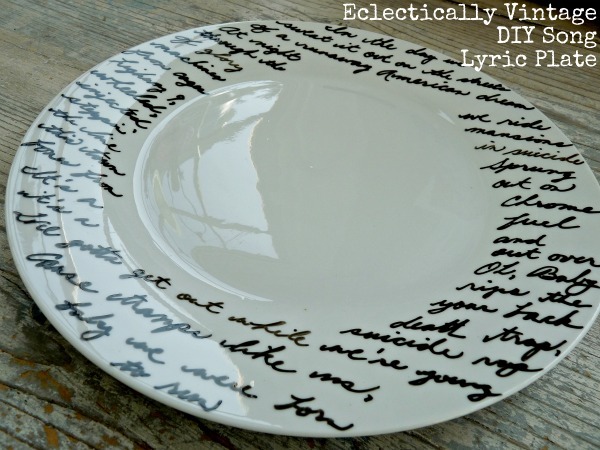 Can you believe they referenced my Song Lyric Plate that I created years ago (see how to make it here). 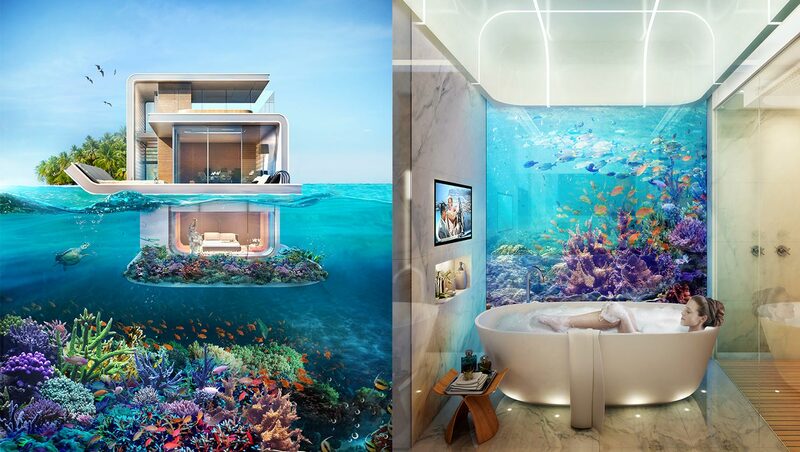 It’s all about water and one over the top example is the Floating Seahorse house in Dubai that is partially submerged under water. 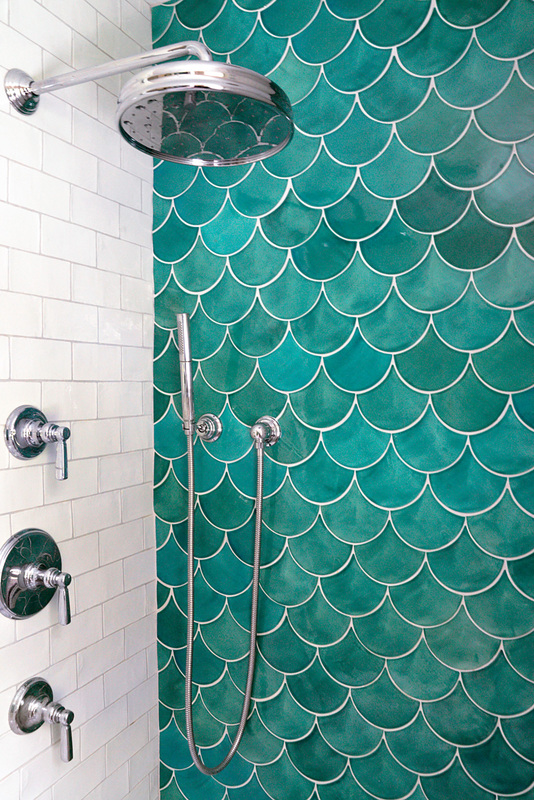 Colors – layers of blue including cool aqua and azure tones in tiles and textiles including fish scale patterns like this shower from Mercury Mosaics. 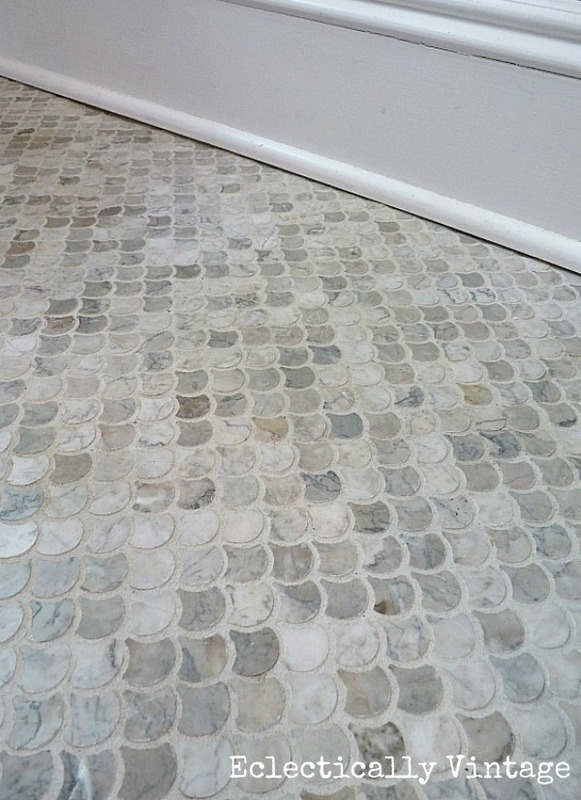 I installed fish scale tile in my entrance vestibule eight years ago and still love it. Glass bubbles – in lighting with blues and iridescent colors. 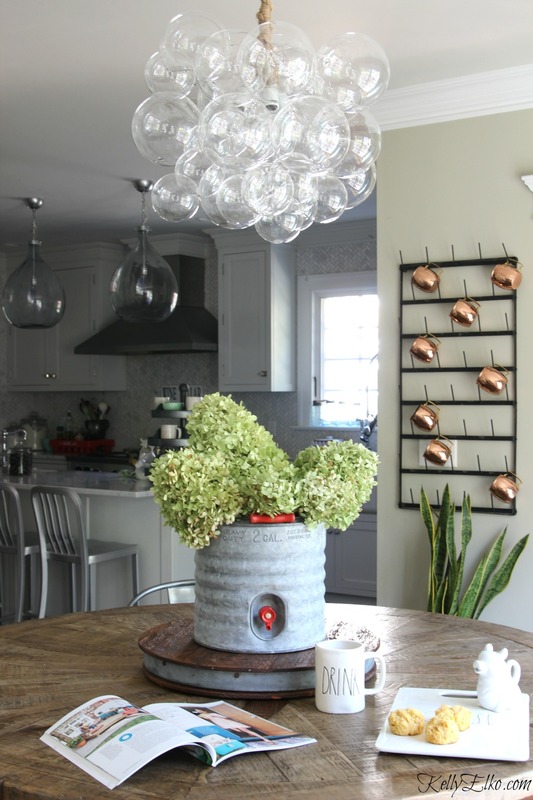 I love my bubble chandelier over my kitchen table. Sea world – starfish, coral and especially the octopus will be everywhere – can you see my octopus plate (second from top). It’s all about living like a local and immersing ourselves in travel and culture. The world is or home and authentic experiences are valued. 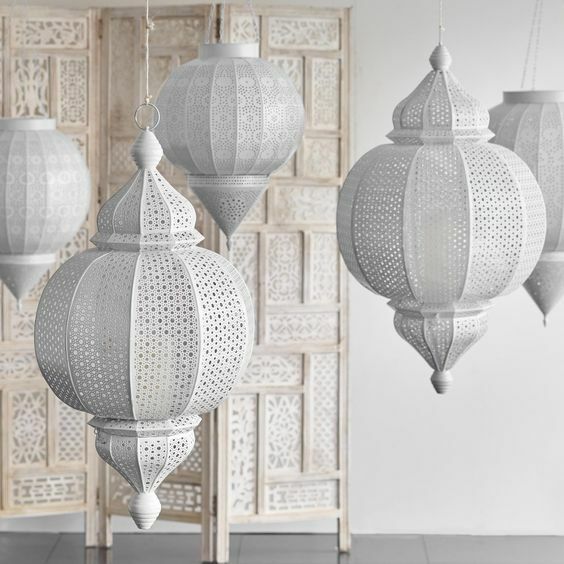 Cutouts and light and lace and shadows reminiscent of Moroccan lanterns. 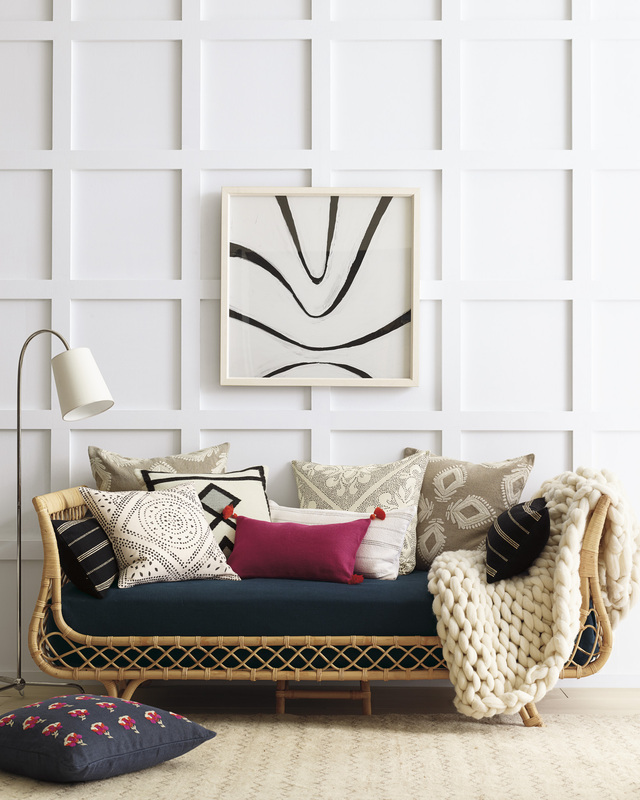 Lacey hammocks and daybeds, wicker and rattan furniture with a more modern edge – I have been coveting this rattan daybed and think it would be fun in my living room piled high with colorful pillows. 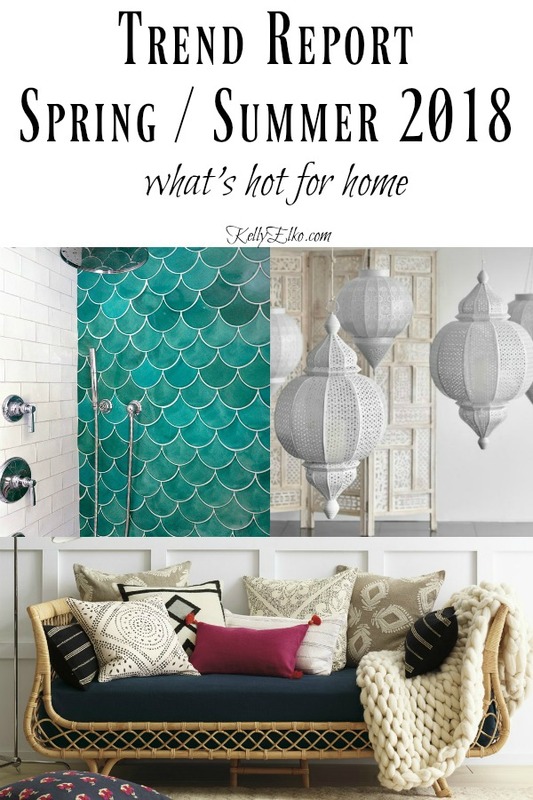 Stencils and wallpapers will mimic intricate tile patterns. Lots of pattern and mixing and matching. Bricks in the home – accent wall or entire room. 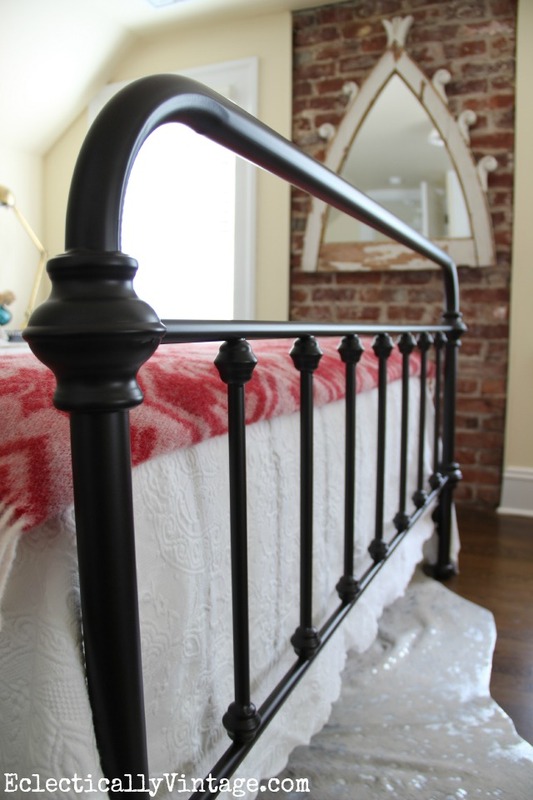 I kept some brick exposed in my attic guest bedroom when we renovated – it really makes the room! Cement textures on floors and walls and moves out of the kitchen into every room in the house. 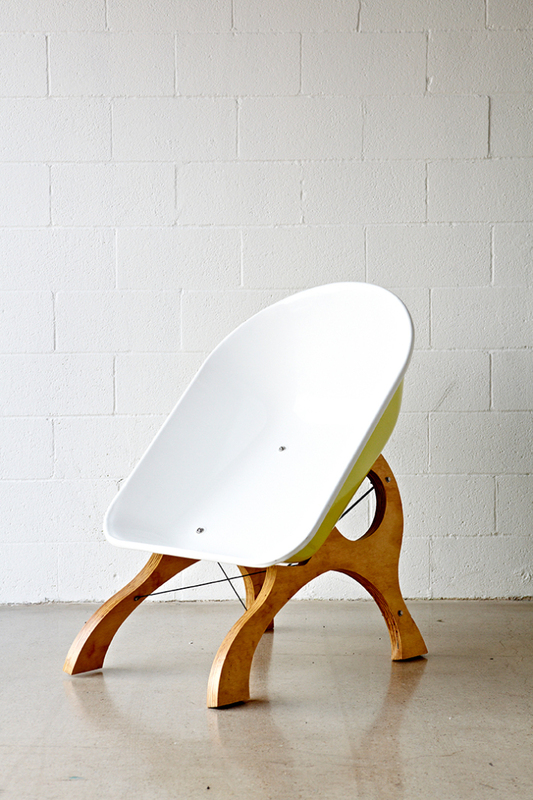 Recycle old finds like this wheelbarrow chair in a sleek and modern way. Neon has been huge for years and is still going strong. Iridescent metallics will be everywhere. So there you go – what will be trending in 2018. What do you already own? Anything you are really loving? I go where the wine is served! 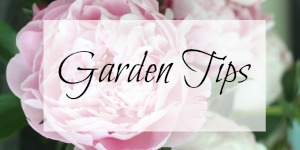 Kelly, I enjoyed your trend update & love your blog! At my house we have an old school library & have embraced a strong travel theme in our decor. My favorite are the framed vintage travel posters reflecting places we have been, plus a charming plate we bought on our honeymoon in Mexico that reads (in spanish) “The most beautiful decorations in our home are the people who visit.” We’ve completed our travel vibe by also incorporating 3 paintings that have a Mexican/California beach vibe. I think we even got one from Home Goods! I do love their store! I love that you use what you love and things that have meaning to you Karen! do you mean 2017 or 2018? I love the floor with scale pattern in your home! 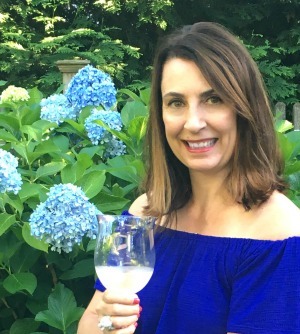 2018 Jill – they forecast trends over a year in advance! Darn it, I’m gonna have to redecorate, the only thing I’ve got is the partially submerged floating house. Watch out for scuba divers when you’re taking a bath! 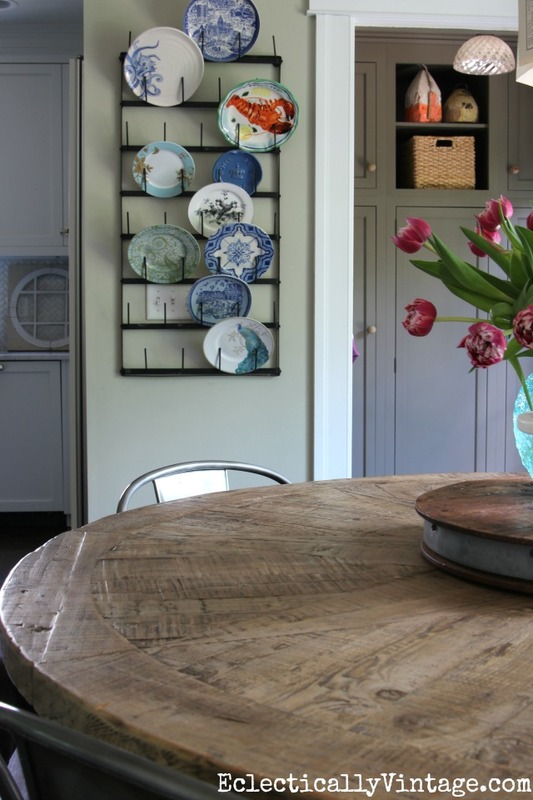 Loved seeing the examples of the design trends in your home! Hey Kelly, You’re ahead of the trends!! Must be why I love to read your blog. We are updating our kitchen. I like tile but everyone tells me granite. What is the long for kitchen counter tops? Kelly , what are they saying about paint colors for foyers, kitchens with honey oak cabinets and family rooms? Are they predicting gray will be “the” color for 2-3 more years? Two colors in the family room? THANKS! I didn’t hear anything specifically pertaining to honey oak cabinets. As for gray, I’ve been painting my interiors a beautiful shade of gray and have a few more rooms to paint. I don’t care about “trendy” colors – I just go with what I love! I only care about trendy colors because we are selling our home and need to appeal to buyers; otherwise, I would go with what I like (as I did with the honey oak cabinets 10 years ago). Love your visuals and examples, furthering the trend update. Question: Where did you obtain the kitchen “rack”, displaying the copper mugs?